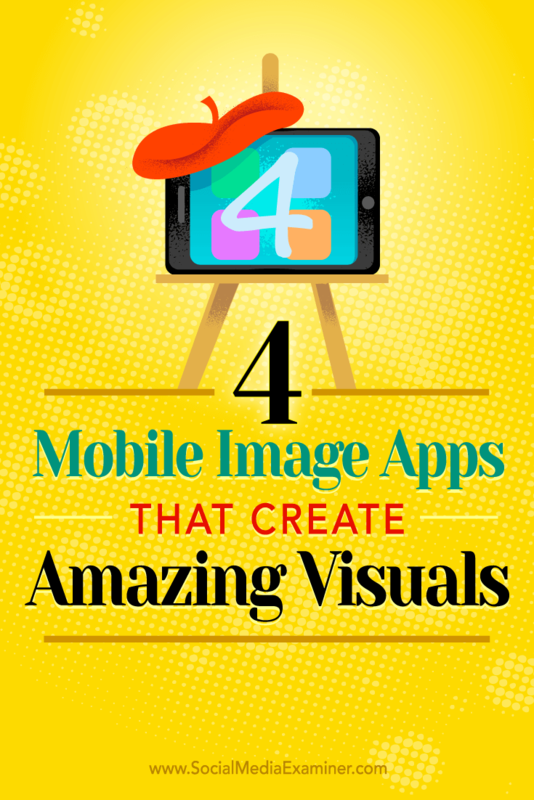 Discover four mobile apps to create beautiful images. Prisma has a variety of artistic filters you can apply to your photos. Using the app, you can turn anything into a beautiful picture, whether it’s an image of a person, object, or landscape or a photo from someone else. The app is especially helpful for people who use stock photos and don’t have a huge budget. Prisma can infuse style into any image. If you need to post an image but it isn’t quite good enough for your social media accounts, use Prisma to enhance it. For example, I needed to use a picture of my laptop and Prisma made it look artistic. Prisma adds excitement to ordinary pics. To use Prisma, upload a photo or take a picture in the app. 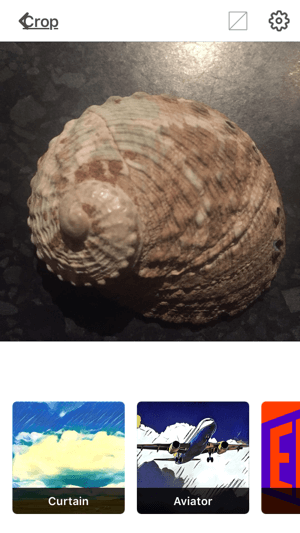 For example, this photo of a shell isn’t really Instagram-quality but it has a nice shape and texture. Start by uploading a photo to Prisma. Next, scroll through Prisma’s filters to find one you like. Some of the styles work better than others, so experiment with different looks. Prisma’s filters include those of famous artists, such as Picasso and Van Gogh. Also, styles like Mosaic, Paper Art, The Scream, and Electric can give your images a variety of looks from painting and sketch to cubism and abstract. Because some filters are artistic and others are more photographic, choose filters that go with your branding. 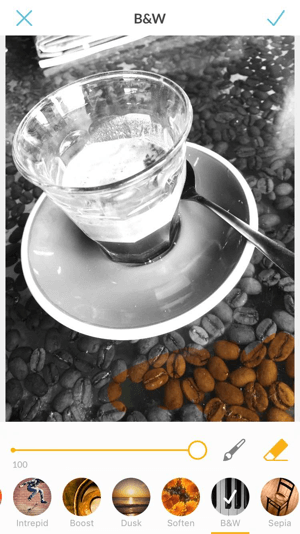 After you apply the filter (Curtain was used in the image below), you can fine-tune it by swiping left and right to change the filter percentage. This is how you can incorporate subtle effects into your graphics. When you’re pleased with the results, share your image to Instagram or Facebook, turn it into your profile picture, or download it to your camera roll. Share images to Facebook and Instagram from the Prisma app. Prisma also has a new photo-split feature. Just swipe up or down to create a split screen effect. Try the split-screen feature for another interesting look. 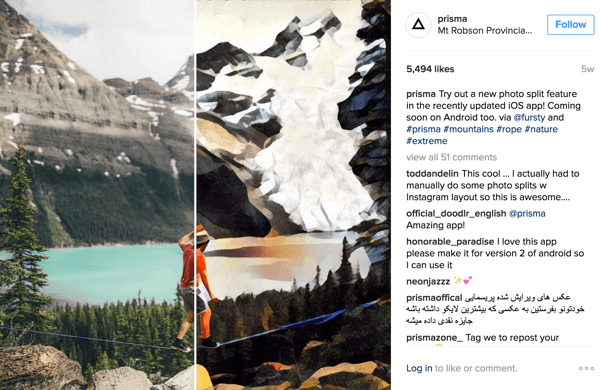 Prima gives your images a fun artistic look, but don’t overdo it. You want your special images to catch your audience’s attention when you use them. If you plan to use Prisma a lot, use the same filter style for all of your Prisma pics. 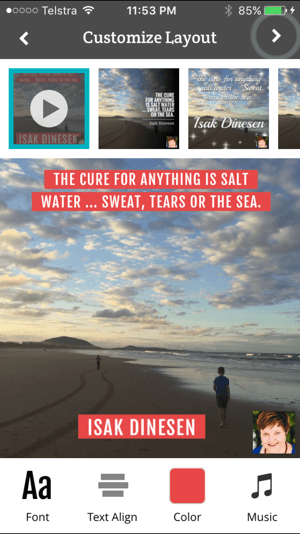 Prisma is a mobile app only (available on iTunes and Google Play) and it’s free. 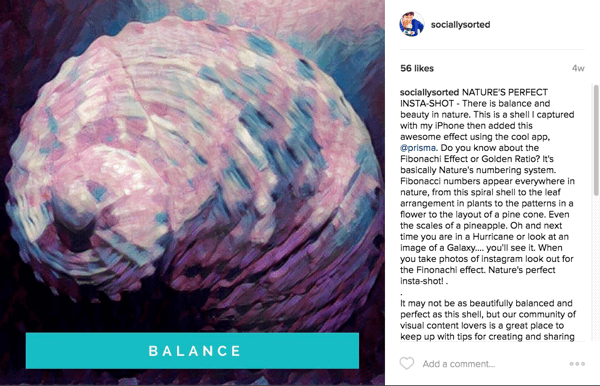 For inspiration, check the Prisma Instagram feed. Short videos grab attention in the social media feed. 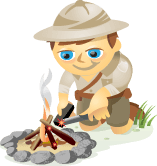 Ripl makes it easy to create animated social media posts. 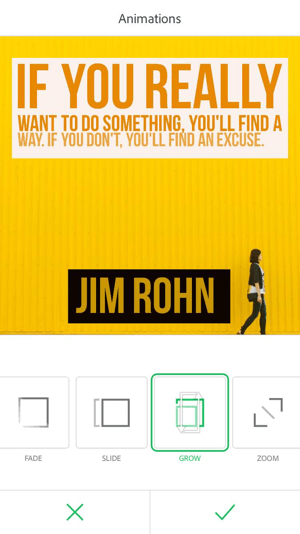 With Ripl, you can add up to eight images with multiple text overlays, and create a mini-slideshow. This is a great option for a tutorial or to showcase an event, location, or product. For example, this realtor used Ripl for a home tour. The free version of Ripl gives you a range of styles, fonts, and colors. It also lets you add music. The pro account is $9.99/month, and gives you unlimited access to premium designs (more than 75 with new ones every week). You can add your own music or choose from Ripl’s library, add a custom watermark or logo, and schedule posts. There is also more storage, so you can save your creations to your camera roll. To get started, create a post. Tap Add Photos to upload a picture (or pictures) to the app. 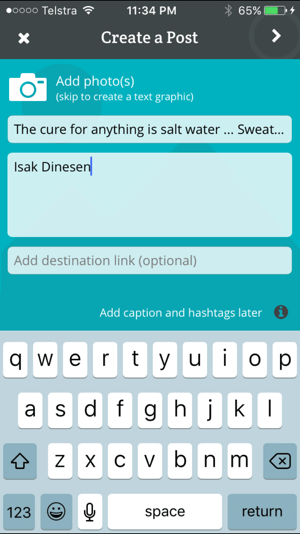 Then for each pic, add your primary text overlay and any secondary text overlay, as well as a destination link if you want it included in your caption. The link, however, is not clickable. Create a post and then add images and text. Next, choose your layout and animation style. Depending on which layout you choose, the app will offer different options you can change, such as font, background image, animation style, color of overlay text, music, the ability to switch text on and off, and more. Depending on the layout you choose, you’ll have different elements to adjust. When you’re finished, add a caption and hashtags, and then post it directly to Facebook, Twitter, and Instagram. Ripl is an excellent tool to use for teaching or showcasing something. Plus, if you have editing skills and a program like iMovie or MovieMaker, you can splice your Ripls together to make a longer video. Ripl is available for iOS only, but you can join the waiting list for Android. Check out the Ripl Instagram feed for more examples. PicMonkey is a photo editing tool as opposed to an image-creation app. This means it offers Photoshop-type options and cool effects to incorporate into your pics. If you want to improve your images and add special elements, this is the app to use. 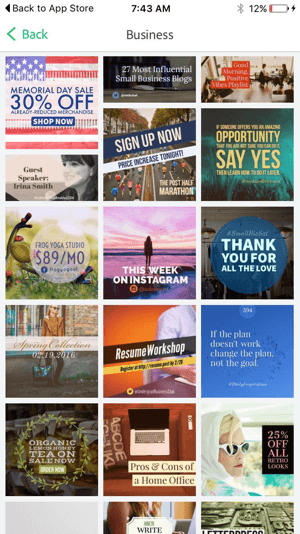 When PicMonkey launched their mobile app, they choose the fun parts of the desktop app to streamline it and make it tappable and easy to use. I like that PicMonkey has opted for a few key functions, rather than trying to incorporate everything. This app is about quick, beautiful photo editing, and it’s well-suited to uplift your images for Instagram. To get started, open PicMonkey and select an image from your camera roll to edit. There are a few basic things you can do within the app. For example, you can adjust your image and crop, rotate, or resize it. Crop, rotate, or resize your image in the PicMonkey app. You can also add special effects to your image, such as layers of filters. This example uses the Orton filter. Add filters to your images. It also has a black-and-white filter layer on top of it. Layer one filter on top of another. Using your finger or a stylus, you can draw on the image to add or erase different photo effects, such as sepia, black and white, dusk, and so on. The more effects, the better. Use your finger or stylus to erase some of the top effects of the image, so the bottom layer shows through. Draw on the image in any color and change the color of big portions for dramatic effect. Most of the black-and-white effect has been removed to show the coffee bean background in color. PicMonkey also lets you add text to photos and change the font, color, and style of your words. 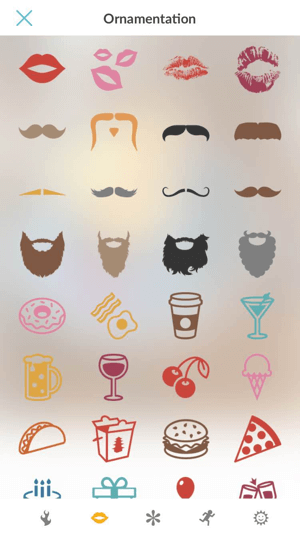 Plus the app has a variety of stickers you can add to your images. There are different stickers available in PicMonkey. Tap on the sticker you want to add to your photo. Click a sticker to add it to your image in PicMonkey. When you’re happy with it, save your image to your phone, share it, or save to the Hub (PicMonkey storage) so you can work on your images in both the mobile app and desktop tool. PicMonkey is free and available on iTunes and Google Play. Royale membership starts at $3.33/month and includes advanced tools and effects, Hub storage, and more. This is a good companion app for creating images for your social media sites. PicMonkey is not a fancy image-design app; it’s meant to be simple for fast editing and photo effects for quick posts. Adobe Spark is a wonderful template tool for creating fun, fast images, pages, and videos. Like PicMonkey, it’s available via the web and as an app. Adobe Spark syncs between your desktop and mobile device, so you can work on the same piece in both places. Start on the go, and then finish on desktop, or vice versa. The Remix feature is one of the greatest benefits of Adobe Spark. Start with a template and then alter your images for different social media platforms. Choose a category or image to get started. After you log in with your Adobe or Facebook account, choose a category or a featured image. For example, browse the business designs and select one that fits your purposes. Adobe Spark has multiple images in different categories if you need a starting point. After you choose a template, you have the option to use the provided image or replace it with one of your own. Click the Palette button to auto-color your pics on a theme. You can also easily resize your image for all of the usual social media networks. 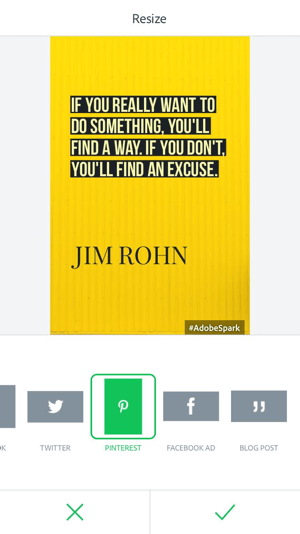 For instance, resize the image to portrait size for Pinterest. Click the left icon at the top of the screen, and choose the social network for your image. Adobe Spark has magic text, meaning the app automatically resizes the text and topography to fit the screen. Select the social network for the image. You also have the option to remix the design with another style. Click the Theme button, select the design you like, and click the checkmark to save your changes. Once you have an image you like, click the checkmark to save it. Adobe Spark makes it easy to animate a still image into a short video post, as it’s one of the template options. Click Animation and then select the type of animation you want to use such as fade, slide, grow, zoom, grey, or blur. Tap the screen to test the different options, and then click the checkmark to save your changes. Decide how you want it to animate. Animate an image with one click. It doesn’t get any easier than that. Adobe Spark is free to use and offers 2GB storage. If you need more space, you can buy up to 20GB of storage. The app is available on iTunes. 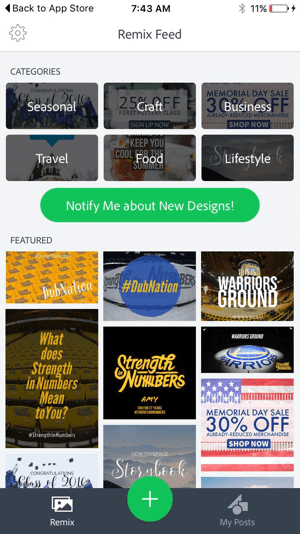 Adobe Spark doesn’t have the full customization of Canva (which also has a mobile app). However, there are easy templates and a library of stock images for professional-looking image posts. 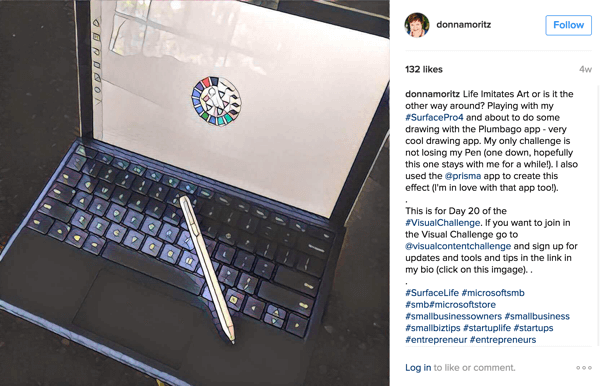 It’s an excellent option for those who don’t like to design, but want an easy-to-use tool to create regular image posts for social media platforms. All of these apps are great for creating profile images and social media posts and several have options to add video to make your posts stand out. After you experiment with these tools, you’ll find your go-to apps and figure out your favorite styles, filters, text overlays, animations, and themes. From there, it becomes even easier to create a series of images for Instagram, Pinterest, and Facebook. 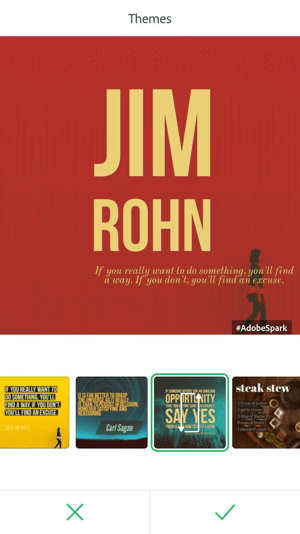 Use these mobile tools to create an image whenever inspiration strikes. For example, if you hear a great quote, see a fabulous background image, or think of something interesting to share behind the scenes, it’s just as easy to create an image as it is to write a note, take a picture, and create it later. People want to know about people, so when you capture and share moments as they happen, it will allow for more engagement and visibility within your community. What do you think? 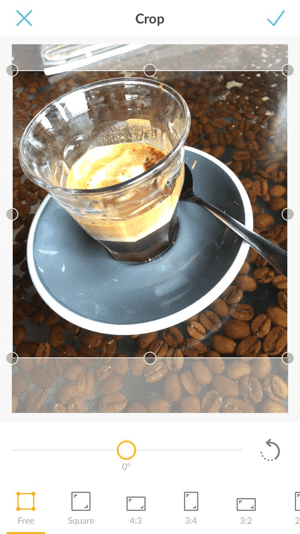 Do you use mobile image tools? Which are your favorites and why? Please share your thoughts in the comments. 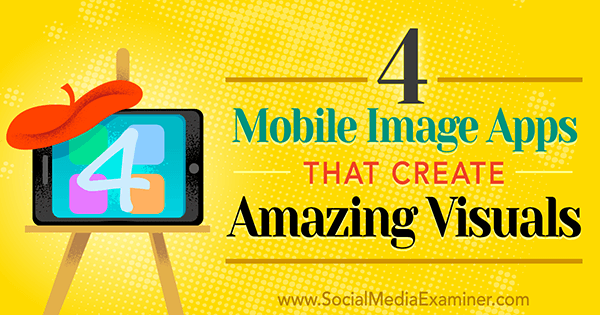 Tips on four mobile apps to help you create amazing social media images on the go.